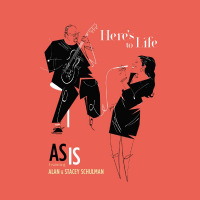 Here’s To Life is the newest CD by AS IS, featuring jazz guitarist Alan Schulman and jazz vocalist Stacey Schulman. The CD is an eclectic mix of tunes that showcases Stacey’s versatile vocal stylings and Alan’s soulful acoustic and electric jazz guitar playing. Their debut CD, A Love Like Ours, was a duo project that hit #1 on the Amazon jazz vocal charts in its first week of distribution. This time around, they have partnered with some of the top talent in the New York area, including such Grammy bona fides as producer James McKinney, recording & mixing engineer Scott Jacoby, mastering engineer Emily Lazar, and drummer Marcus Baylor, who spent many years performing with the Yellowjackets and whose latest release as a leader, The Baylor Project, received a 2018 Grammy nomination for Best Jazz Vocal Album and Best Traditional R&B Performance. Indeed, there are many twists and turns and unpredictable moments throughout this CD, as exemplified by their take on “A Night in Tunisia.” They expand the thematic desert concept of the tune and create an exotic effect by opening with Duke Ellington’s “Caravan” and adding Brazilian rhythms performed by master percussionist Alejandro Lucini, as well as a vocalese choir sung by Stacey along with Christie Dashiell , Carl KokayI" Walker, and James McKenney. Here’s To Life will be available in stores and online everywhere. Listen to “Street Life” on Soundcloud.